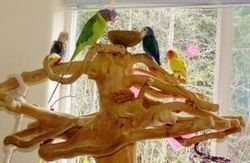 Natural Java Tree Playstands for Birds - FREE SHIPPING! The tree photographed is the tree you will receive. Guaranteed to be insect free! Great fun and activity for all birds from Conures to Macaws. Base size: 10 1/2" x 16 1/2"
Recommended for small birds, such as Cockatiels, Caiques, Pionus, Ringnecks, Conures and similarly sized birds. Base size: 22" x 14 1/2"
Recommended for small to medium sized birds such as Conures, Pionus, Caiques, Small Macaws, Greys, Eclectus, Amazons and similarly sized birds. Base size: 28 3/4" X 18 1/2"
Recommended for Smaller birds, such as Conures, Caiques, Pionus, Lovebirds, Tiels and similarly sized birds. Recommended for Smaller birds, such as Conures, Caiques, Pionus, Lovebirds, Tiels and similarly sized birds to medium birds, such as larger Conures, Amazons, Eclectus, Timneh Greys, Congo Greys and similarly sized birds.. 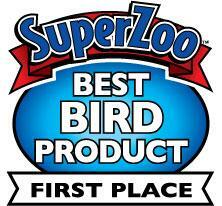 Recommended for Medium birds, such as Eclectus, Greys, Galahs, Amazons, Mini Macaws and similarly sized birds. Recommended for Medium to Large birds, such as Eclectus, Greys, Galahs, Amazons, Smaller Macaws, Cockatoos, Large Macaws and similarly sized birds.